You are a Monarch Butterfly. Autumn has arrived and you are crouched on a branch on Long island at the starting block of a marathon flight. Your number is on a round plastic tag attached to your wing. While your attention is to the prevailing winds and the passing cirrus clouds, you are aware of the wing that is wearing the identity tag, much like a marathon runner wears a number on his shirt. But with a few differences. The human marathon runner races 40 kilometers (26 miles) over the course of a few hours. You, as a marathon butterfly, will be racing for a month or two, traveling 4,000 kilometers (2,500 miles). How much additional attention will you give to your tagged wing as you are exhausting your energy a kilometer above the ground, traveling south to Mexico? Tagging of Monarch butterflies (Danaus plexippus} began in earnest in 1940, when Fred Urquhart, a Canadian zoologist, developed tags that stuck and stayed on the underside of a Monarch’s wing. He, and his wife Norah, studied Monarch migration and were largely responsible for the discovery and tracking of the Monarchs’ trails across North America. 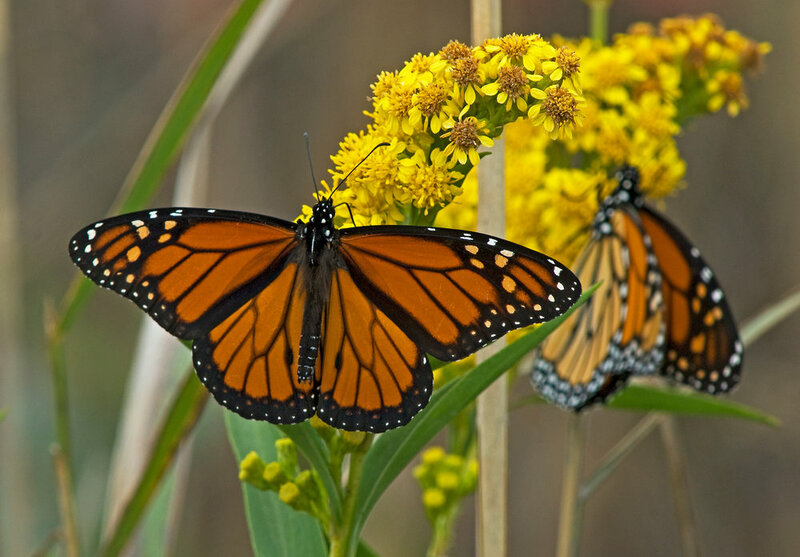 His studies also revealed the Monarchs’ multi-generational method of migration northward. The tagging played a key role in verifying Fred’s hunches. Eventually, in 1975, a “winter hideout” of thousands of Monarch butterflies was found in the transvolcanic belt of Mexico on a mountaintop in Michoacán, Mexico. A dozen more such sites have since been found in Mexico. Once in Mexico, the Monarchs move from mountain to mountain. These sites are now protected by Mexico. While many scientists had already been studying Monarchs in these areas for decades, they had not come across any that were tagged. It was not until Fred Urquhart came down to the site that he, himself, found a labeled Monarch, originally tagged in Minnesota, and produced the evidence that these Monarchs came from areas further north of Mexico. Fred and Nora founded, what would become, “Monarch Watch”. Volunteers helped in their research by tagging butterflies and reporting their sightings. More than a million Monarchs have been tagged since the founding of the program. And about 100,00 monarchs are tagged each year. The program has proved itself as an important tool to substantiate monarch flight paths and destinations. And the program, with the help of its volunteers, undoubtedly played a role in the protection of the sanctuary sites in Mexico. And this, in turn, has helped the monarchs. As we look forward, we may want to consider also, the many Monarch butterflies that played a role in the tagging activities. After all, they are the ones that wear the tags and fly them south. As it turns out, most of the tagged Monarchs recovered within the United States and Canada are found dead. Why? Among the many reasons that may be offered, one cannot help but to consider, as one looks at a lifeless tagged butterfly, that one culprit could certainly be the tag, itself. A basic, obvious complication of tagging that could jeopardize a Monarch is the initial handling of the delicate butterfly. The butterfly may fly away with the tag, but, once it has flown out of sight, may die due to a damaged wing, excess pressure on the body causing internal damage, fraying of the fragile wings, or damage to the legs, antennae or eyes. We must not forget that the Monarchs emerging from chrysalises at the end of summer and into early autumn, are the ones that will be taking that grueling flight of thousands of miles of migration. And so, it is more important than ever, that this generation of Monarchs, as they climb out of their pupal stage, be in optimum condition. Laying attached on the membrane of a butterfly’s wing are tiny scales, in the order of 60 micrometers. These scales, which lend the colors to the butterfly, also play an important role in thermoregulation, providing insulation. 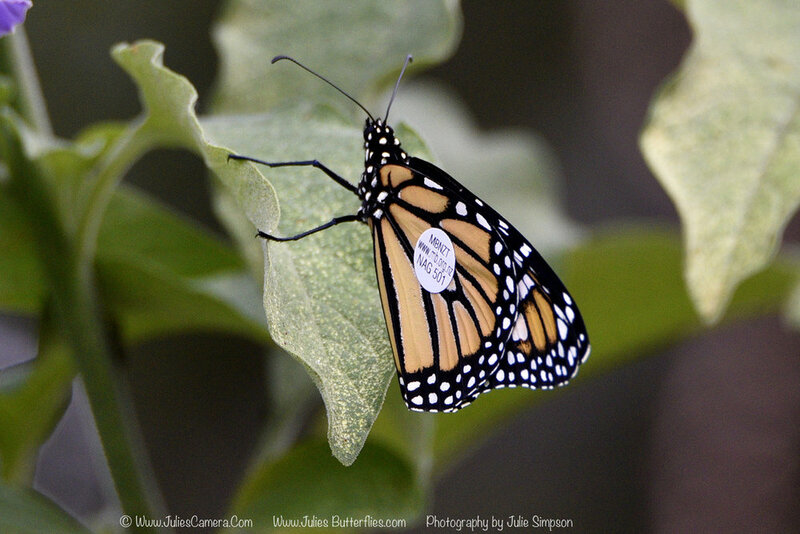 The darker red and black scales of a Monarch butterfly absorb sunlight, warming it up. When a butterfly’s wing is touched, these tiny scales are dislodged and come off as a fine powder. The more scales that are lost, the more heat absorption is negatively affected. Glider pilots have seen Monarchs flying at altitudes of 2 miles high. If enough scales are disrupted, the Monarch, when flying at such heights in migration, will be chilled beyond tolerance. A butterfly’s wing may have as many as 600 scales per square millimeter on the surface of its wing. This density shows the importance of insulation on an insect that relies on absorbing and retaining heat from the ambient air. When areas of these scales are lost, due to trauma, there develops an area of weakness where warmth may leak out. The scales also help repel water in all its forms of rain, drizzle, and mist. Wings that have lost small spots of scales become vulnerable to, not only loss of warmth, but also chilling from cool water. Even tiny changes in scale thickness can have a big impact on how well the scales absorb heat. In addition, the scales help keep the wings clean, and free of debris. Aside from the larger veins that give the wings structure and strength, the Monarch has a tiny tubular network of veins that are so small you cannot see them. These minuscule veins that run along a butterfly’s wing are in the form of hollow tubes that provide passageways for hemolymph, a fluid that circulates from the body to the wings and back to the body. As this fluid passes through the wings, it picks up heat and passes it on to the body. Any bruising or interference of this circulatory system will afflict the Monarch. As you may begin to see, the mere handling of a Monarch costs the butterfly some form of compromise. What additional toll might the monarch pay once a tag is affixed to its wing? The tags are made of a polypropylene plastic, in the shape of a circle, 9mm in diameter. They have a waterproof adhesive that sticks to the distal wing and are printed with waterproof inks. The weight of the tag is .01 of a gram. Sounds negligible. You would hardly detect its weight in your hand. However, when you consider the weight of the butterfly, .50 of a gram, that number starts to become relevant. And when you compare it to the weight of a 150 pound human, that would translate, through some simple math, to a 3 pound weight. So, in a crude analogy, a Monarch butterfly that is being recruited to freight a .01 gram sticker to Mexico is like an Ironman athlete, duct taping a 3 pound MacAir laptop to his leg and running 2,500 miles with it to Michoacán. We would expect a high dropout rate. About 100,000 Monarchs are tagged each year. Granted, some Monarchs are reported to make the trip to Mexico with the tag. However, the number of Monarchs recovered with tags in their sanctuaries in Mexico is about 1% of the tagged butterflies. Is it not unlikely, that since the majority of retrieved Monarchs are picked up lifeless, that the burden of the tag is affecting them? Aside from bearing the weight of the tag, and the consideration that the tag is altering the heat variable where it is adhered, it may also be affecting an area for oxygen exchange within the thin membrane of the wing. Then there is the less obvious effect of the tag, with its adhesive coating, affecting the flexure of the wings. When you think of having a band-aid on your arm and you twist your arm, you can appreciate that you often can feel the tug of the tape on the skin as you rotate your arm. The wing of the Monarch allows for slight torsional deformation, which renders it some aerodynamic resilience. The adhesive-backed tag undoubtedly effects a strain when the wing as it is trying to bend. This may not be crucial in resident Monarchs as they flit about a field for the summer, but when challenged to perform the herculean task of migration, this may become life threatening. The balance of the two wings is another unseen issue that may also prove critical. When your car is driving on the road and begins to wobble or favor one wheel, it may be due to an imbalance of a wheel. So, your auto mechanic may recommend a wheel alignment, along with balancing your wheels. A typical car wheel weighs 22 pounds or about 10,000 grams. Little zinc wheel weights are attached to your wheel rim to balance them. These little 10g weights make enough of a difference to keep an entire car running better on the road. The ratio of the zinc clip to the car tire is about 1:1,000. The ratio of the 01.g tag to the .50 Monarch is about 1:50. Again, simple algebra will show that the imbalance being imposed on the butterfly wings with the addition of the tag is about 20 times greater than that of the car wheel. With the tag, the Monarch is flying with asymmetric, unbalanced wings. It soon becomes hard to believe that the tags are not effecting the Monarchs. We must then ask ourselves, what is the price the Monarchs are paying and what is the value of continuing to tag them? Initially, Monarchs were tagged to track them. We now know their general flight paths from Canada to Mexico and back. We now know that their southern migration is a long one to sanctuaries in Mexico and that their return migration is multigenerational. We also now know that the major problems Monarchs are currently facing are loss of habitat, pesticides that kill insects and butterflies, and herbicides that kill their food supply. When Fred Urquhart initiated tagging and found one sporting a tag in Mexico there were about a billion Monarch Butterflies. That population has plummeted by 90 % in the last 2 decades to about 100 million. With the Monarchs losing so much habitat and so much of their population, is it still judicious to put the surviving ones in possible jeopardy with a handicap of plastic tags? Are there still pertinent life saving questions that necessitate tagging or have we reached the point of diminishing returns of worthwhile statistics? Will there come a time again, when wild butterflies fly free?